Iguazu Falls are on the bucket list of so many people, as it was on ours as well. And these powerful falls are so worthy of your time. I can’t express just how magnificent they are. 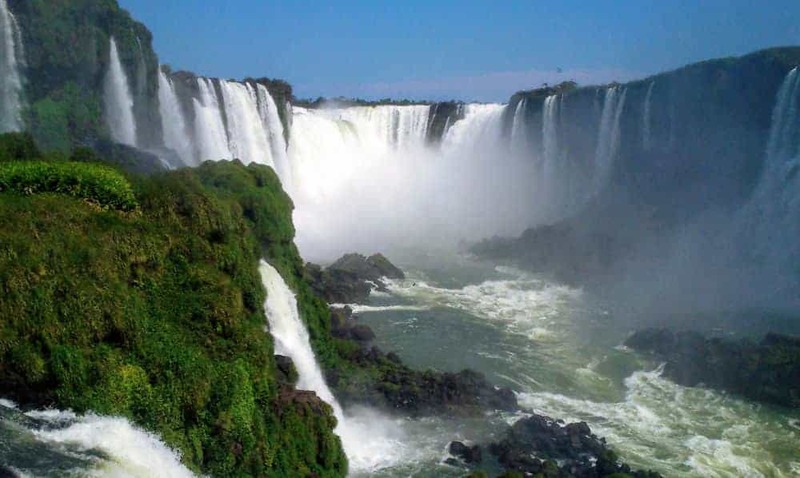 But you can always check out our post about Iguazu Falls and see for yourself! Most people visiting Iguazu Falls in Argentina and Brazil, choose to stay in the nearby town of Puerto Iguazu on the Argentina side. 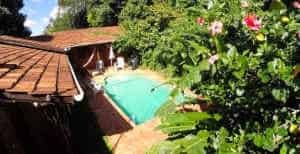 When searching for a good Hostel in Iguazu, you might be wondering what to make of all the reviews and hostel descriptions. 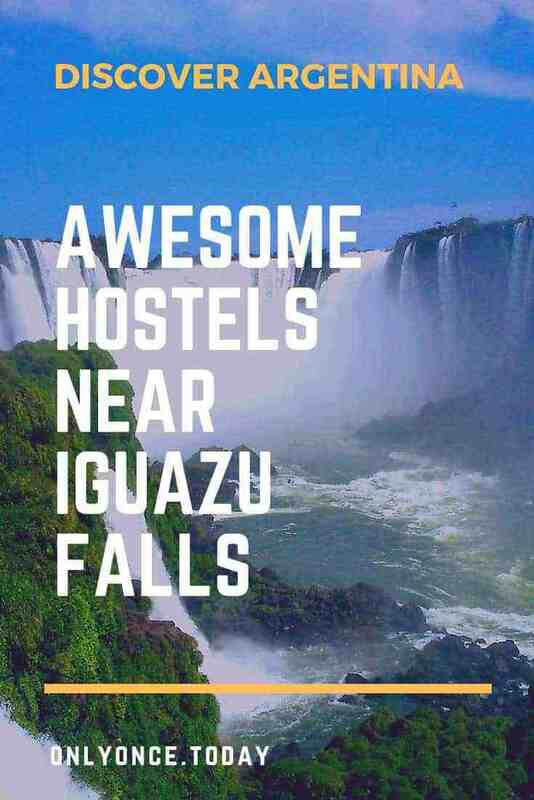 So we narrowed the search down to the 4 very best Iguazu Hostels right here! Nomads Hostel is the best hostel in Puerto Iguazu since it provides everything a budget backpacker needs. The hostel is family-owned, which gives the place a nice and homely feel. With a convenient location near the bus terminal, it’s easy to get to the falls on your own with a public bus. This hostel looks good and it has a communal kitchen you can use to cook your own meals. There are also some restaurants nearby. Nomads Hostel is quite basic but good and you get to save your money! There’s also a swimming pool, which is a very good idea in Iguazu temperatures! You can either book a bed in a dorm or get a private room. Both options are very affordable! Breakfast is included in your room price. Poramba Hostel is a little further from the bus terminal, about 10 to 15 minutes walking. But you might want to walk the extra 5 minutes for all the amenities they offer! 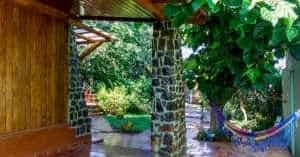 This hostel has a beautiful large garden with a swimming pool and outside lounge area. In Poramba Hostel, you can meet other travelers and socialize with them. It has a chilled backpacker vibe. There’s a great kitchen you can use and breakfast is included in your room price. You can either book a bed in a dorm or get a private room. Prices in this hostel are among the cheapest in town. Poramba hostel offers basic accommodation for the best price in town. Tucan Hostel is a small family-run hostel in the center of Puerto Iguazu. It’s just a short walk to reach the city bus terminal. Staying in Tucan Hostel feels slightly like a homestay and guests are very happy with the homely and welcoming feeling they had in this hostel. There’s a beautiful garden with relaxing areas and a swimming pool. Breakfast is not included, but there’s a fully equipped kitchen at your disposal. At night, there are regular asado’s or BBQ’s held at the hostel. In this hostel, you can either get a dorm bed or a private room. Prices are good and affordable. Nativa Iguazu is located a little outside Puerto Iguazu, but you can easily get to town by bus. It’s a beautiful place to get in touch with nature. The hostel has a beautiful garden and you have easy access to a river to go swimming. Breakfast is not included, but there’s a fully equipped kitchen you can use to cook your own meals. In Native Hostel Iguazu, you can book a bed in a dorm or get a private room for very democratic prices. Still in doubt about which Iguazu Falls hostel to pick? If you want to meet other travelers and have a swimming pool: Nomads or Poramba. If you want to feel like you’re at home: Tucan Hostel. Want to get away from the city and get in touch with nature: Nativa. Argentina can be pricey and if you’re trying to save your money for other things than lodging, Argentina can be a difficult place to do that. That’s why we collected the best and budget-friendly hostels in Puerto Iguazu. We definitely hope you found your perfect dream hostel in Iguazu after exploring the ones in this list!